Since 2004 Moray Security Ltd has established itself as one of the premier security suppliers in Scotland. From Security Guards to Door Supervisors our SIA compliant company provides you the customer with tailored solutions to assist you with your business. All of our front line staff are trained to the SIA standard at a minimum with many recieving more thorough training to reflect their years of service to us. They are at the core of what we do and as a forward facing company we are happy to invest in them knowing it better serves our customer. We keep our range of services small which allows us to excel at what we do. By concentrating on Security Guarding, Door Supervision and Event Security we can ensure each customer receives the service they demand from our senior managment and staff. All of our Staff hold the relevant Security Industry Authority Licence for their area of work and are vetted to the British Standard 7858. Supported by our team of duty and contract managers they provide a level of service expected by our clients. Find out more about our Security Guarding Services for retail, offices and site management. 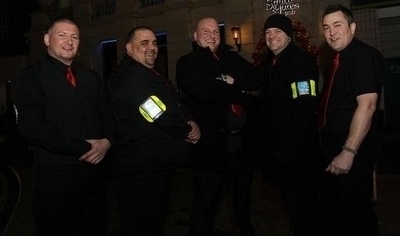 Find out more about our Door Supervisors and the forward facing services they provide. Find out more about Event Security and Stewarding Services for Scotland. Whilst our Security Services are mainly utilised in the North of Scotland in areas such as Grampian, Highlands and Lochaber we do provide coverage throughout the whole of Scotland with prior arrangement.